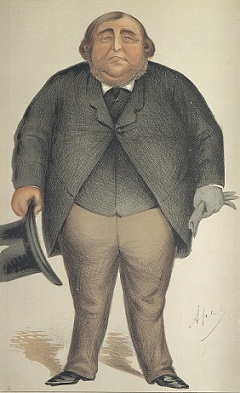 From 1867 to 1886, Victorian England was enamored with the trial of Thomas Castro, otherwise known as Arthur Orton, but most often referred to as “the Tichborne Claimant.” In 1854, Roger Tichborne, heir to the Tichborne Baronetcy, set sail from Rio de Janeiro as a passenger on the ill-fated Bella. The cargo ship was lost at sea and all passengers, including Tichborne, were presumed dead. Refusing to accept this fate and believing rumors that the ship’s crew had landed in Australia, his mother, Lady Tichborne, began advertising in Australian newspapers offering a reward for information on the whereabouts of her son. A butcher from Wagga Wagga, Australia came forward claiming to be the missing Roger Tichborne. The claimant was accepted by Lady Tichborne and a number of household staff but his claim to Tichborne’s identity and the fortune that came along with it found many detractors among extended family and high society. Nearly five years after the claimant arrived in England he was put on trial. What followed were two of the longest trials in English history. 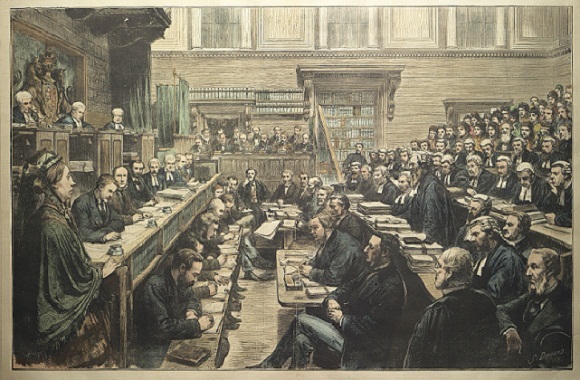 The civil trial, officially an action for the ejectment of Colonel Lushington, the tenant of Tichborne Park, was brought to establish the claimant’s identity as Roger Tichborne and his rights to the family estate.Tichborne v. Lushington began in May 1871 and ended in March 1872. Ninety-seven witnesses testified and more were slated to testify when the jury announced that they had heard sufficient evidence to reach a decision and were prepared to reject the claimant's case. The claimant's lawyers then abandoned their suit and the claimant was arrested for perjury and jailed in Newgate Prison. The criminal trial, Regina v. Castro, was equally long, from April 1873 until February 1874. The jury deliberated for less than one hour before returning its verdict convicting the claimant of perjury for his testimony in the civil trial. In 1874, he was sentenced to fourteen years in prison for his crime, while his counsel, Edward Vaughan Kenealy, was disbarred for his conduct during the criminal trial. Court during the Examination of Miss Mary Ann Loder,"
published by Harper's Weekly, July 12, 1873. Over the course of the two trials, the case captured the imagination of English society. People followed the trial in the newspapers, which printed columns both supporting and refuting the claimant’s case. Supporters established the “Tichborne Defense Fund” to fund the claimant’s defense through the sale of bonds. Songs and plays based on the sensational story were written and performed. After the trials ended, interest did not wane. Public meetings continued to be held addressing the case. Kenealy’s popularity won him a seat in the House of Commons in a landslide victory. Upon his release from prison, the Tichborne Claimant toured the music halls of England. After issuing and then retracting a confession, the claimant died in 1898 maintaining that his true identity was that of Sir Roger Tichborne. Debates over his guilt or innocence continue to this day. Whatever the truth, the case still captivates the imagination of historians, authors, and filmmakers alike. Tarlton Law Library has an extensive collection of items related to the trials of the Tichborne Claimant. Visit our Law and Popular Culture Collection for the 2000 film, The Tichborne Claimant, starring John Kani, Robert Pugh, Stephen Fry, Robert Hardy, Sir John Gielgud, and Rachael Dowling. Head to the stacks to pick up an account of the trial or a fictionalized version of the sensational story. The Tarlton Law Library's Archives and Special Collections contains monographs about the trial, the memoirs of Edward Kenealy, a history of the firm of solicitors who took the claimant's civil case, as well as newspapers, broadsides, playbills, and sheet music.